This is another constellation about which mythology from nearly every ancient civilization is recorded. 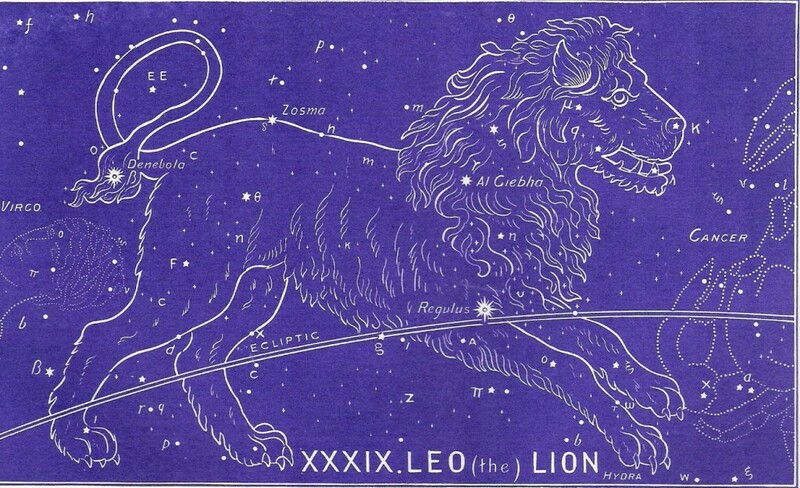 On nearly every ancient star chart, the figure is that of a lion, and there is archeological evidence for believing that the head of Virgo and the body of Leo were combined to create the Sphynx. (See Virgo and Free e-book) The legends all relate this sign in one way or another to royalty, reign, and the dominion of a monarch. Here is the vivid picture, drawn by God Himself, of the fulfillment of the prophecy spoken by Jacob in Genesis 49:9. Here is the Lion of the Tribe of Judah, in whom the birthright promises are fulfilled. This is Jesus, reigning supreme in His Kingdom! With Leo, we begin the final chapter of the final book in this star revelation, and it deals with the final chapter of human history. We see what appears to be yet another conflict, but actually this is the end of the conflict. This is the chapter of fulfillment, and it concerns the final end of our ancient enemy, Satan. This is the picture of the great lion rending the head and body of Hydra, the evil serpent. This will take place at the end of the millennium. The Bile tells us that God will allow Satan to be released from the bottomless pit “for a season” during which time he will go about stirring up the oldest weakness of man — humanism. This is the very heart of the temptation that Satan used on Eve. “You can be like God.” is the lie that tickles our ears even today! And it will be the lie that tickles the ears of those citizens of the millennial kingdom during the reign of Christ. This is hard for us to imagine! But it will be true. At the end of our Lord’s reign, the hearts of some men will be only pretending obedience to the King. They will actually WANT to destroy that perfect system of righteousness to make way for the pleasures of sin. They will clamor for the right to “do my own thing” and “be the master of my own destiny.” These are the lies that fool so many today, and they will be used again, with great effectiveness, by Satan when he is allowed a short season of insurrection. He will go about recruiting men and women to join him in a rebellion against God’s sovereign reign. It will be his last ditch effort to foil the eternal plan of God — and it WILL fail!!! This rebellion will be destroyed by the Lord Jesus Himself as He brings to an end this First Creation. What will follow is called the New Heavens and the New Earth, and it has not entered into the hearts and minds of anyone to even begin to imagine what that new creation will be like! But one thing is for certain — the Lord Jesus Christ will be the sovereign monarch of all the universe — and WE will rule and reign with Him. And one more thing — EVIL, even the possibility of it, will be destroyed forever! This is the wonder and awe of this majestic lion, Leo. The picture is of a lion, fully grown and in the fullness of its maturity, powerful and triumphant! He is destroying the serpent, Hydra. We come to the final chapter of fulfillment. The old promise made by God Himself in the garden of Eden has at least come to pass. The King reigns in majesty. (Psalm 97:1) We see here the completion of a promise, for here is a kingdom of peace and prosperity that will continue from the moment it begins to its intended end 1000 years later. Then, Jesus will put down all His enemies, the last of which is death itself. Even the short-lived rebellion of Satan will be summarily crushed by the power of His might. Then comes the end of the First Creation — and the beginning of The New Heavens and The New Earth. To continue in the correct order of the ancient star chart, please select Hydra next. Be sure to download your copy of the Free e-book that discusses the historical, cultural, and biblical evidences for this amazing star revelation.